office is at Block 26a PRESIDENT GOOD LUCK JONATHAN ESTATE ISHERI LAGOS , NIGERIA .Helping Hands Inter. is an NGO that enables you to better the lives of people positively with evidence. Every religion supports charity & caring 4 d less privileged so I knew i was on d right track with H2i. Cheap entry amount..right? With just N6,600 donation u re on board to earn tremendous incentives even as u touch lives. You re to introduce ONLY 2 persons who also brings their own 2 each and u're good to go.However, H2i allows one person to have more than one account. If you have the capacity to invite more than two people, you can choose to go for multiple account registrations. 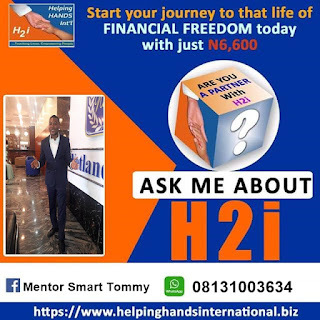 In H2i u earn cash daily,weekly, monthly depends on u. H2i requires...'TEAM WORK'Unlike other MLM where uplines use downlines to climb and den drop dem. In H2i, u grow only wen ur team grows. Its online & can be done frm anywhere /any country with internet connection. There's no monthly renewal or whatever name other MLM networks calls it.. Other MLM's place their juicy awards i.e car, holidays etc at their level stage 7 - 9 while H2i has ipad/laptop on Stage 2 plus $1,000, car at stage 3 plus $3,000 etc.The best part is dat with H2i, u can open as many accounts as possible in ur name. manage your business real time.